Credit a pop star with opening a Sanibel business. Motown great Michael Jackson’s hit tune “Billy Jean,” a song with a memorable beat and a whole lot of rhythm, helped Susan Scott start the Enchanted Ballroom, today with two locations, one in Sanibel and her new Bonita Springs location featuring European champion dancer Stephan Zhivkov. 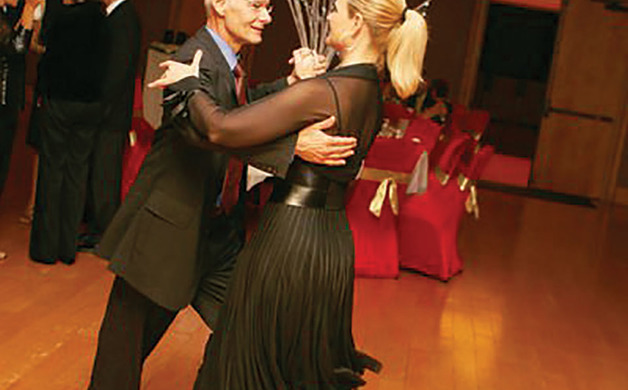 Scott in 2010 danced the cha-cha to “Billy Jean” with Steve Wilkie, owner of the Fred Astaire Dance Studio in Stuart, Florida. The pair won the “Dancing with the Islands” competition in Sanibel. “We won three perfect 10s,” Scott says. Once that event ended, Wilkie asked to Scott to keep on dancing. With a few more competitive wins and confidence, Scott opened the Enchanted Ballroom in Sanibel, later her Bonita location. Both studios provide private and group lessons, where dances like the cha-cha, salsa, swing or burlesque can be learned. 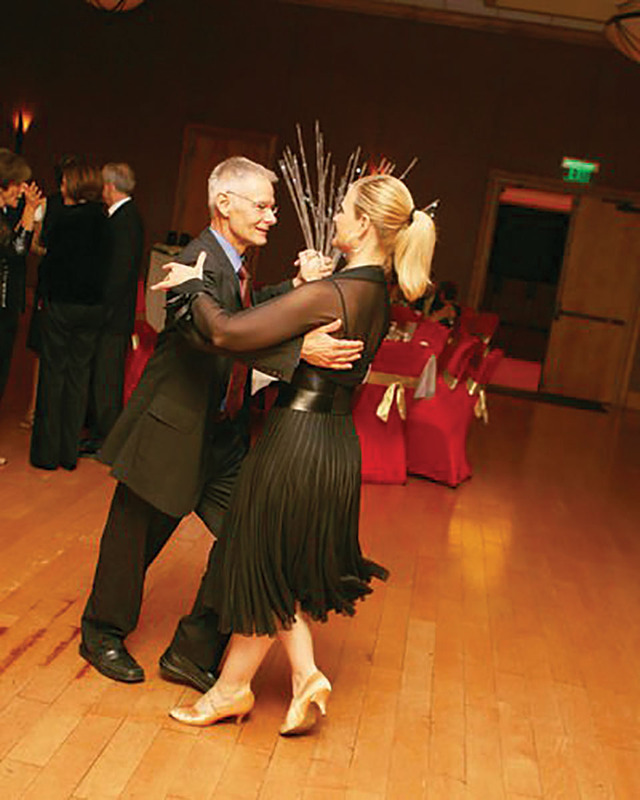 Enchanted Ballroom also offers social party opportunities, where dancing is part of the fun. The Bonita Springs location is quickly stepping into new heights, as they recently brought back the gold, Scott says. “After competing in the spring 2015 ‘Swing into Summer’ dance competition held in Naples, the dancers from Bonita Springs made some impressive wins and rose to the top of every division,” says Scott, noting that participants danced American and international styles including the Argentine tango. Smith took Top Competitor honors and Lee was tops in her division after returning to the dance floor after 15 years. Susan Scott danced with Lukas Klotzsche of Dresden, Germany. “I’m proud to say that we won the Top Silver division,” Scott says. Students want to discover dance for a number of reasons, Scott says: Competition, to prepare for weddings or special events, the benefits of exercising to music, or just plain fun. “Dancing is also a good way to meet people,” says Scott, who has met people from all over the world, especially during dance competitions. Although Scott wears formal dance attire for competition, students need wear just comfy clothes and leather-soled shoes. And they don’t have to worry about a dance partner. “Singles are welcome,” she says. Scott believes that anyone can learn to dance. So even if you’ve got three feet instead of two, Scott’s instructors are well versed in working with all levels of experience—from beginners on up to the advanced level. “We have a terrific team of instructors,” adds Scott. Cindy Starnes of Fort Myers is a National Dance Council of America registered emcee [eight years], a registered nurse and also an accomplished ballroom dancer. She agrees with Susan Scott that anyone can learn to dance. “People who have never danced and then try to dance, many find that they can learn to dance and love it,” explains Starnes, who especially loves dancing the tango. Starnes comes from a dancing family who all love to compete. Her father is the Hon. Hugh E. Starnes [retired Circuit Judge] and her mother is Judy Starnes, the owner of Janet Marie Studios, Fort Myers. Besides dancing, Starnes enjoys emceeing dance competitions, also known as “heat” for amateur competitions and “Pro-Am” for professional events. The emcee makes sure the competitors are on the dance floor, and ensures judges are aware of any changes. “An emcee also keeps the crowd energy going,” says Starnes, who has emceed the Orlando Dance Classic, the Jacksonville Star Ball, and the Sunshine State Dancesport Competition in Miami Beach. For those looking to learn to dance, Starnes offers these tips: Find a dance studio and go to weekend social dances. Try group lessons during the week [male and female students are rotated during the lesson, so a partner is not needed]. And lastly, don't be afraid to try private lessons. “Learn to dance and you won't be sorry you did,” says Starnes, adding that beginners will meet tons of new friends and have a fabulous new hobby that’s good for the mind, body and spirit. The key to succeeding at anything is getting started. Both Enchanted Ballroom locations offer fun classes and workshops in such activities as adult ballet, swing dance and east coast swing. Check theenchantedballroom.com for details. 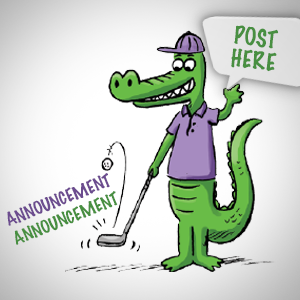 Ann Marie O’Phelan is a Southwest Florida resident who enjoys exercise and who loves to try new things.